By now, you’ll be familiar with the idea of Software-Defined WANs (SD-WANs) and know that they are set to be the next big thing in corporate networking. 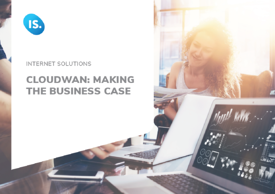 Here, we make the business case for CloudWAN, the new SD-WAN solution from Internet Solutions. We demonstrate how its deployment can benefit an enterprise in five core areas, a kind of checklist for CEOs. It’s essential that any SD-WAN product ticks all of these boxes.